Rotary vacuum paddle drier consists of a stationary cylindrical shell, mounted horizontally, in which a set of agitator blades mounted on a revolving central shaft stirs the solids being treated. Heat is supplied by circulation of steam, hot water or thermic fluid through the jacket, and also through the hollow central shaft and agitator arms. the agitator can be helical ribbons or paddle type. The sweeping blades promoted product contact with the heated walls of the drier, facilitate mixing and help achieve maximum blending and heating action. The hollow shaft and the paddle arms considerably increase the heat transfer area and thus a high heat transfer co-efficient is achieved. The products are charged into the drier shell through one or more number of ports situated on top of the shell. Vacuum is applied through necessary filters, condenser, vacuum trap etc., by means of a water ring vacuum pump or any other vacuum system like ejectors etc. 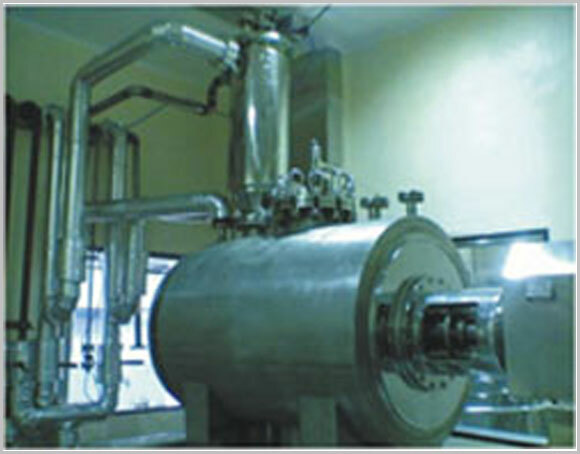 Heat is supplied by steam / hot water / hot thermic fluid. Products at the end of the drying cycle are discharged through quick opening discharge port.